Arco Iris (6445 Midlothian Turnpike) has amazing papusas and chicharonne, a supermarket with a restaurant in back and is 100 percent run by Latino workers. The other one is Honeywhytes All American Café (2116 E. Main St.), which has a limited burger menu but their buns and meat are very fresh and come in great combinations. When we go out it's generally a splurge since we love to cook and have great ingredients available to us. But on the occasion that we are in a hurry or just too busy to bother, we like Stanley's Store (14242 Mountain Road, Glen Allen), which is the halfway point to our house in Montpelier. It's an oasis on the way to nowhere. Stanley's Store is not a gourmet grocery, it's a country store that makes simple, real food, cooked to order. I tend toward a basic burger and sweet potato fries, and [my husband, Henry Reidy] likes the egg salad sandwich or the sausage and egg biscuit. They have a few tables inside, but opt for the picnic table out front. Also, Pho So 1 (6403 Rigsby Road), because sometimes you just need a bowl of pho. Pho is great because everyone can customize it with tripe or no tripe, tendon or no tendon, mild, medium heat or spicy. Pretty obvious, in my house we go for No. 1. Thank goodness my stepsons like it, too. It's also great as takeout. The smallest, funkiest place I like to go to on a regular basis is Pho Tay Do (6328 Rigsby Road). 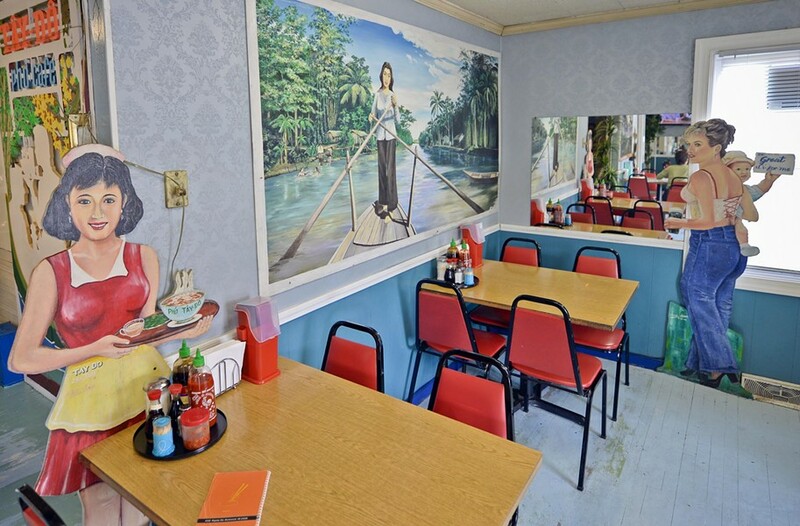 Bizarrely decorated with wooden, painted cutouts of Julia Roberts as Erin Brockovich and other random people, and cash only, but delicious Vietnamese. And they give you candy when you pay. All right, my first pick is Pho Tay Do (6328 Rigsby Road). Cheap and cash only, but so delicious and life-affirming. Their broth is nourishing and the best hangover cure. And Garnett's (2001 Park Ave.). During happy hour, you can get a craft beer and a sandwich for under $10. Super retro cuteness abounds.